Gosh, I find Oliver Fricker really pitiful. Damning evidence, including emails ordering paint, photographs and a wire cutter used to cut through the fence of a train depot, left Fricker with little choice but to plead guilty in the hope of getting a more lenient sentence. The prosecution said his laptop computer contained 53 images and one video file of vandalised trains. Prosecutors said Fricker and Alexander became friends after meeting in Australia in 1997 and the vandalism took place when Alexander visited Singapore as a tourist. In his May 13 e-mail, he indicated that he was going to do something with his Swiss friend and some ‘non-legal things also”. Lloyd arrived here on May 15. The next day while he and Fricker were waiting for a man to deliver the carton of paint at City Hall MRT station, Lloyd asked if it was legal to paint graffiti on trains in Singapore. Fricker said yes. The accomplice had told Fricker that he had found out from Google where the MRT depot was and where all the MRT trains were parked. That evening, the pair proceeded to SMRT Changi depot to recce the place and left shortly because of the rain. Late that evening, DPP Lim said both men, each carrying a small bag with a few cans of spray paint, entered the depot after cutting a hole in the fence. Fricker sprayed the word McKoy on the left of the train carriage. The other word Banos was spray-painted on the right. Lloyd took some photographs of their work before they left through the gap. Fricker was arrested on May 25. The court heard that SMRT’s estimated losses totalled about $11,000. The case was adjourned to later in the afternoon for mitigation by his lawyer, Mr Derek Kang. “In this case, Singapore should thank Oliver instead of some terrorist for exposing the security lapses in our public transportation system,” said Subhas Anandan, head of the criminal law practice at KhattarWong in Singapore. “That should be one of the mitigating factors.” Anandan isn’t involved in the suit. The Swiss embassy in Singapore was providing consular care to Fricker and will attend the court proceedings as an observer, said Peter Zimmerli, deputy head at the embassy. He declined to comment on whether the embassy will plead for leniency on Fricker’s behalf. 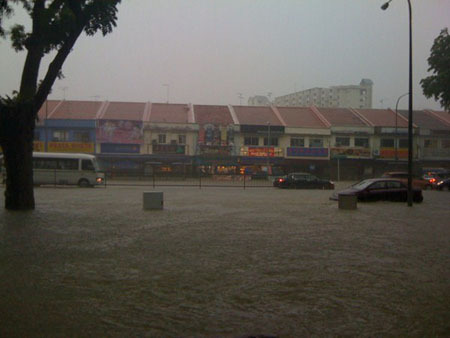 Meanwhile there are more Flash Floods in Singapore. The rain caused trees to fall and standstill traffic in the morning rush hour. This entry was posted in Singapore Headlines and tagged court, floods, Heavy Rain, Life, Lloyd Dane Alexander, MRT, news, Oliver Fricker, photos, Singapore, Swiss, Switzerland, weather. Bookmark the permalink.